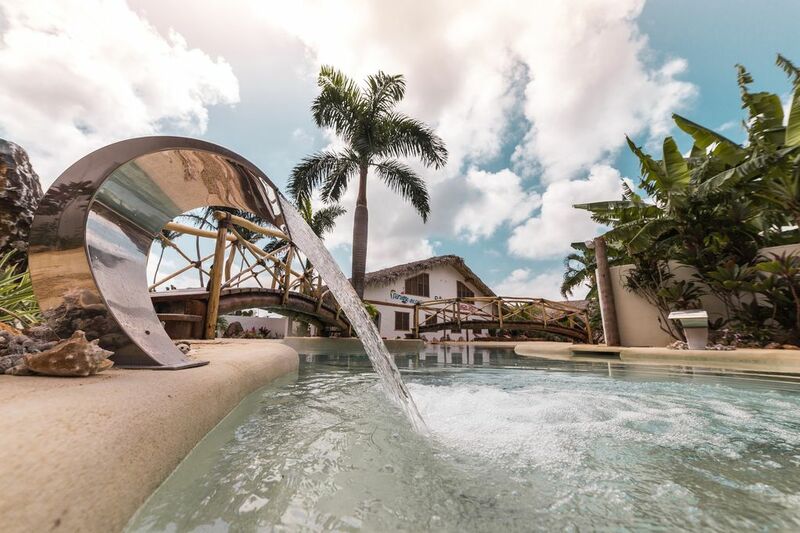 The Villa Caribeña of Paradiso del Caribe villas resort has 3 bedrooms each with its private bathroom, large living room, full kitchen, large terrace overlooking the garden, all in a space of 80mq. Paradiso del Caribe is a small complex consisting of 17 accommodation units of different sizes, with a large natural pool of sand and rocks, a restaurant, a bar next to the pool and common areas with facilities. Distant 700 meters from La Playita and Playa Grande, two beautiful white sand beaches, and 150 meters from the center of Las Galeras, is ideally located to enjoy the most beautiful attractions of the Samana Peninsula, such as Playa Rincon, Playa Fronton, Playa Madama, the waterfall of Limón, Cayo Levantado, the National Park Los Haitices and the unique phenomenon in the world;; the whales in reproduction. The whole complex is rustic, romantic and marked by the highest elegant simplicity in the purest Caribbean style, with coconut roof and palm leaf roofs, beautiful stone walls and floors of natural coral, with furniture in pale coconut or bamboo built Hoc, very comfortable, with spacious rooms, very high ceilings, an excellent Italian restaurant, bar service by the pool and a very familiar and "friendly" atmosphere, friendly and pleasant staff. The complex has a fantastic pool to enjoy day and night in natural sand and rocks with corals and madrepores, equipped with cervical cuts and aerotherapy, with incredible and romantic light effects. In this type of pool it is pleasant to spend a lot of time: sunbathing, swimming, lying down, sitting, walking in the water, talking, drinking something, enjoying cervical massage or aero therapy, reading, etc.